Durable, all-steel keg flow insert works with many pallet rack systems. Add to new or existing rack for an affordable keg storage upgrade. 24" wide flow lane is perfect for "sixer" (1/6 barrel) kegs, the most common craft keg size, so it can accommodate most of your craft brew inventory. Provides greater storage density with more pick faces than traditional pallet storage. Get more out of your valuable warehouse space. Significantly improves picking efficiency. 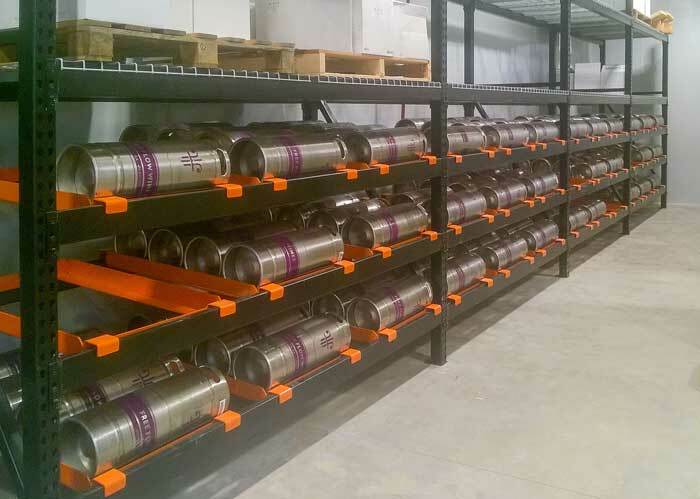 SKUs stay organized in separate lanes, and kegs roll to the front of the rack for safer, more comfortable handling. Simplifies first-in, first-out product flow: load kegs in the back of the rack and pick from the front. Front-loading also possible on shorter rack depths. Sixer capacity is the number of 1/6 barrel kegs that can fit into each keg flow unit. 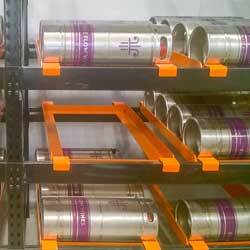 Keg flow racks transform ordinary pallet rack into specialized sixer keg storage.